As seen in THE NEW YORK TIMES - READER'S DIGEST - SPIRITUALITY & HEALTH - HUFFPOST Featured on NPR's RADIO TIMES and WISCONSIN PUBLIC RADIO When a painful loss or life-shattering event upends your world, here is the first thing to know: there is nothing wrong with grief. Grief is simply love in its most wild and painful form, says Megan Devine. It is a natural and sane response to loss. So, why does our culture treat grief like a disease to be cured as quickly as possible? 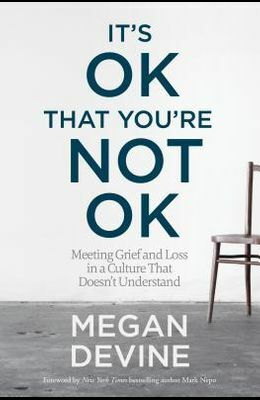 In It's OK That You're Not OK, Megan Devine offers a profound new approach to both the experience of grief and the way we try to help others who have endured tragedy. Having experienced grief from both sides--as both a therapist and as a woman who witnessed the accidental drowning of her beloved partner--Megan writes with deep insight about the unspoken truths of loss, love, and healing. She debunks the culturally prescribed goal of returning to a normal, happy life, replacing it with a far healthier middle path, one that invites us to build a life alongside grief rather than seeking to overcome it. In this compelling and heartful book, you'll learn: - Why well-meaning advice, therapy, and spiritual wisdom so often end up making it harder for people in grief - How challenging the myths of grief--doing away with stages, timetables, and unrealistic ideals about how grief should unfold--allows us to accept grief as a mystery to be honored instead of a problem to solve - Practical guidance for managing stress, improving sleep, and decreasing anxiety without trying to fix your pain - How to help the people you love--with essays to teach us the best skills, checklists, and suggestions for supporting and comforting others through the grieving process Many people who have suffered a loss feel judged, dismissed, and misunderstood by a culture that wants to solve grief. Megan writes, Grief no more needs a solution than love needs a solution. Through stories, research, life tips, and creative and mindfulness-based practices, she offers a unique guide through an experience we all must face--in our personal lives, in the lives of those we love, and in the wider world. It's OK That You're Not OK is a book for grieving people, those who love them, and all those seeking to love themselves--and each other--better.